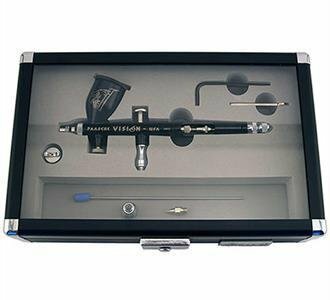 Home / Airbrush Set "The Vision"
The Vision airbrush is in our Talon line. This means that it can use all of the same heads that the TG or TS airbrushes use including the Fan Aircap. The Vision will come installed with our new .2mm head, hand polished hardened stainless steel needle, sloped trigger, air atomization control and the black chrome plating. 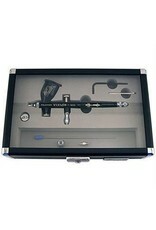 The Vision will be the finest detail airbrush in Paasche's line. The TGX-2F also comes with the size 3 head (.66 mm), fan aircap, 0.2 mm head, new trigger design, hand polished needle, atomization control and black chrome finish. The Vision can also use larger Talon heads.